1.1Accessibility to broadband high-speed Internet continues to lag behind for certain population groups in Canada, notably communities in rural and remote areas. This is despite significant investments by the public and private sectors to support broadband deployment. 1.2Most Canadians have Internet services available to them if they choose to subscribe to these services. However, Internet speeds in urban areas are superior to the speeds in rural and remote areas. In 2016, about 96% of urban Canadians had access to broadband Internet speeds of 50 megabits per second (Mbps) for downloading data and 10 Mbps for uploading data (50/10 Mbps). Only 39% of Canadians living in rural and remote areas had access to the same speeds. This meant that for approximately 5.4 million Canadians, only slower Internet speeds were available. This gap between urban and rural areas is common in many member countries of the Organisation for Economic Co-operation and Development. 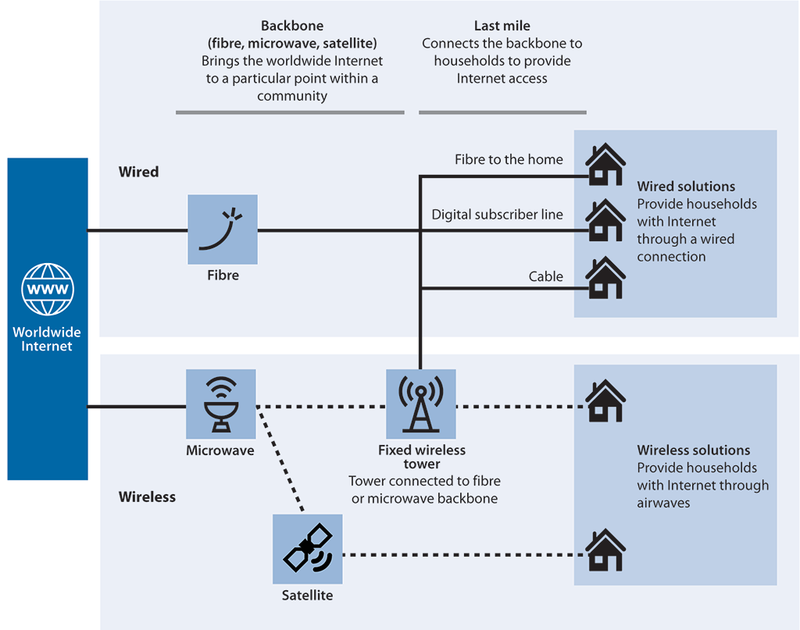 1.3Broadband infrastructure includes the “backbone,” which consists of two forms of main data routes: wired, which delivers data via a fibre optic cable (also called a fibre line); and wireless, which delivers data via a microwave station to a fixed wireless tower or a satellite (Exhibit 1.1). Users access the backbone through a “last-mile” connection, which may be a wired connection—via fibre, a digital subscriber line (DSL), or cable—or a wireless connection to a fixed wireless tower. Wireless last-mile connections can also be provided by satellites. The Canadian Radio-television and Telecommunications Commission (the Commission) is an administrative tribunal that regulates and supervises Canadian broadcasting and telecommunications. It operates at arm’s length from the Government of Canada. Innovation, Science and Economic Development Canada (the Department) is the federal organization responsible for supporting access to the Internet, setting legislative and policy frameworks, and managing spectrum frequencies efficiently and effectively to maximize the public benefits. 1.5The importance of Internet connectivity. In its December 2016 Submission to the Government of Canada’s Innovation Agenda, the Commission stated that access to broadband Internet services was vital to Canada’s economic, social, democratic, and cultural fabric, and that Canadians would increasingly need to have access to broadband Internet services to participate in the digital economy. It also set a universal service objective that all Canadians should have access to voice services and broadband Internet services on both fixed and mobile networks. 1.6The Commission said it would use criteria for speed, capacity, quality of service, and coverage to assess progress on the Internet portion of the universal service objective. It said that Canadian residential and business subscribers to fixed broadband Internet services should be able to access speeds of at least 50/10 Mbps, and to subscribe to an unlimited data allowance. The Commission expected that the universal service objective would be reached by 2031. It also said that the latest generally deployed mobile wireless technology should be available in Canada not only in homes and businesses, but also on as many major roads as possible. 1.7Again in its December 2016 Submission to the Government of Canada’s Innovation Agenda, the Commission noted that it was important for all Canadians to have broadband access. The Commission suggested that the federal government was best placed to assume a leadership role on this issue. 1.8The Commission called broadband a “transformative enabling technology” and concluded that any Canadian without broadband access is profoundly disadvantaged. Furthermore, the Commission said that coordinated national action was necessary to address the problem of insufficient broadband access, and that the risks of non-action included missed opportunities for innovation, creativity, and engagement; reduced competitiveness; weakened domestic prosperity; and diminished prospects for Canadians. 1.9As part of its review of basic telecommunications services in 2016, the Commission announced that it will create a fund that could have up to $750 million available in the first five years to help it meet its universal service objective. The fund will be managed by a third party and will focus on underserved areas. 1.10In its April 2018 report, Broadband Connectivity in Rural Canada: Overcoming the Digital Divide, the House of Commons Standing Committee on Industry, Science and Technology said that preventing Canadians in rural and remote areas from participating in the digital economy creates a “digital divide” that increases the challenges those areas already face. 1.11The Standing Committee asked the Department for a comprehensive strategy on broadband connectivity, developed in consultation with various stakeholders, such as the Commission; different levels of government, including First Nations; the telecommunications industry; and non-governmental organizations. 1.12In June 2018, the government announced a review of the Broadcasting Act, the Telecommunications Act, and the Radiocommunication Act. This review is intended to consider whether any changes are needed to the legislative framework for the digital age. 1.13This audit focused on whether Innovation, Science and Economic Development Canada and the Canadian Radio-television and Telecommunications Commission, according to their respective roles and responsibilities, monitored the state of connectivity, and developed and implemented a strategy to meet the connectivity needs of Canadians in rural and remote areas. 1.14This audit is important because access to reliable and high-quality Internet services enables Canadians to participate in the 21st-century economy and have better access to health care and education. This access also helps people in rural areas to connect with services that otherwise might be available only in urban areas. 1.15We did not examine activities of the Canadian Radio-television and Telecommunications Commission or programs of the Government of Canada intended to address digital literacy, service quality issues, or the affordability of Internet services. In addition, we did not examine the availability of high-speed long-term evolution (LTE) mobile broadband. 1.16More details about the audit objective, scope, approach, and criteria are in About the Audit at the end of this report. 1.17Many examinations of broadband Internet in Canada have recommended that the federal government create a national broadband strategy, but the government has not agreed to take that step. In fact, Innovation, Science and Economic Development Canada has been reluctant to establish a strategy without funding. So, the Department did not have a strategy to meet the connectivity needs of Canadians in rural and remote areas. This means that people in these areas have less access to important online services, such as education, banking, and health care, and do not have information about when they could expect better access. 1.18In 2016, Innovation, Science and Economic Development Canada launched its Connect to Innovate funding program for broadband expansion. However, the Department did not implement the program in a way that ensured the maximum expansion for the public money spent. 1.19Finally, small Internet service providers did not have sufficient access to high-quality spectrum to support broadband deployment in rural and remote areas. The Department auctioned spectrum licences for geographic areas that were too large for smaller service providers to submit bids for. Also, the secondary market for unused spectrum did not function well, partly because licensees had little business incentive to make unused spectrum available for subordinate licensing. 1.20Many detailed examinations of the state of broadband access in Canada have recommended that the federal government lead the creation of a national broadband strategy. However, the government has not agreed to take that step. Innovation, Science and Economic Development Canada (the Department) knew the extent of broadband access across the country and had programs and other initiatives focusing on Internet access in rural and remote areas. However, we found that it did not have a strategy in place to improve access for almost 3.7 million Canadians. 1.22This finding matters because a clear strategy would let Canadians in rural and remote areas know when and at which level they could expect to have access to broadband Internet services. It would also help the federal government estimate the cost to improve broadband access and identify ways to reduce that cost. In addition, a strategy would let the government decide how seriously it regards the problem of the lack of access to broadband Internet services in rural and remote areas. 1.23Our recommendation in this area of examination appears at paragraph 1.37. 1.24What we examined. We examined whether the Department developed and implemented an appropriate strategy to meet the connectivity needs of Canadians in rural and remote areas. 1.25Repeated calls for a national broadband strategy. Various reviews of telecommunications policy recommended that the government put in place a national strategy for broadband. For example, in 2006, the Telecommunications Policy Review Panel called for a national information and communications technology (ICT) strategy that included the objective of “achieving ubiquitous access to broadband networks and services.” It said that the strategy should rely on market forces to the maximum extent possible, and that government should intervene only when market forces alone were unlikely to achieve economic and social objectives. 1.26Specifically, the panel said that the Prime Minister should mandate the Minister of Industry to develop and implement the national ICT adoption strategy in collaboration with key federal, provincial, territorial, and municipal government players, as well as the private, public, and not-for-profit sectors. 1.27As part of an April 2016 hearing for the review of basic telecommunications services, the panel of commissioners of the Canadian Radio-television and Telecommunications Commission (the Commission) called for a coherent national broadband strategy, through an open and transparent process. In its December 2016 Submission to the Government of Canada’s Innovation Agenda, the Commission said that meeting the nation’s broadband challenges would cost billions of dollars over many years and would require coordinated and collaborative action on the part of multiple stakeholders, including the private sector, community and non-profit organizations, the Commission, and governments at all levels. 1.28In its April 2018 report, the House of Commons Standing Committee on Industry, Science and Technology recommended that Innovation, Science and Economic Development Canada develop a comprehensive rural broadband strategy in collaboration with key stakeholders, including but not limited to governments at all levels, civil society groups, Internet service providers, First Nations, and non-profit organizations. 1.29The federal government’s response to the House of Commons committee. The government responded to the Standing Committee’s recommendation of a comprehensive rural broadband strategy. However, the response did not mention a strategy. 1.30The response agreed that access to affordable broadband Internet, particularly in rural and remote areas, was essential for the participation of Canadians in the digital economy. Instead of agreeing to implement a national broadband strategy, the government said that its current approach was comprehensive. It explained that the government’s overall telecommunications policy approach had been to establish marketplace frameworks that fostered competition and investment, to manage spectrum in a way that encouraged the availability of wireless services, and to establish targeted funding programs for rural broadband expansion in areas that lacked a private-sector business case. 1.31The government’s response went on to say that the market-driven approach had served Canadians well. However, it admitted that certain rural and remote areas continued to have limited broadband access because of the challenging business case for private-sector deployment in those areas, and it acknowledged that more needed to be done. 1.32We found that the targeted funding initiatives were not part of an overall plan to improve broadband access to all Canadians, including residents of rural and remote areas. The Department defended the current approach to improving broadband access by explaining that it did not want to set an objective that could not be reached with available funding. 1.33Connectivity objective. In 2016, the Commission noted that there was no clear policy on broadband and its deployment in Canada. As part of its universal service objective, the Commission specified that access to fixed broadband Internet services should be at speeds of at least 50 megabits per second (Mbps) for downloading data and 10 Mbps for uploading data (50/10 Mbps). The Commission expected that the universal service objective would be achieved for all Canadians by 2031. 1.34In 2018, the Department publicly endorsed the minimum service speed target of 50/10 Mbps, but only for 90% of Canada’s population. It believed that the private sector and current government funding programs could achieve that level. In 2016, 84% of Canadians already had access to Internet speeds of 50/10 Mbps. The Department expected 90% would have access to these speeds by 2020. However, this left out 10% of the population: 3.7 million Canadians living in rural and remote areas. For them, the government had no plan to deliver speeds greater than 5/1 Mbps. The government expected that current and future public- and private-sector initiatives would improve access for those Canadians, although progress might be uneven across the country. Connecting 99% of Canadian households, with download speeds of at least 10 Mbps. To achieve this target, the analysis showed a cost of $1.7 billion, including $1.1 billion of public funding. Connecting public institutions, with download speeds of up to 1,000 Mbps. To achieve this target, the analysis showed a total cost of approximately $577 million. Putting in place a long-term connectivity solution for satellite-dependent communities in the North, with download speeds of 10 Mbps. To achieve this target, the Department examined two options: a satellite-only network costing $500 million, with half of the funding to be provided by the federal government; and a hybrid satellite-fibre network costing $850 million, with the government providing at least several hundred million dollars in funding. However, these cost estimates were subject to change, which reflected new technology developments and ongoing public- and private-sector investments. 1.36In 2016, the Department estimated that connecting all Canadians through fibre (with virtually unlimited download and upload speeds) could cost between $40 billion and $50 billion. Other technologies, such as fixed wireless or satellite, could provide high-speed services at a reduced cost. Department officials told us that with those technologies, it might cost at least $6.5 billion to achieve a speed target of 50/10 Mbps in all areas of the country. monitors whether the improved access leads to the adoption of those Internet services. the June 2018 announcement in which the government committed to reviewing Canada’s communications legislation, including the legislative tools needed to promote universal access. Innovation, Science and Economic Development Canada already has comprehensive work under way. The Department has a strong understanding of the baseline of progress, technologies, and costs, which the Department evaluates on an ongoing basis in light of marketplace changes. In spring 2018, the Department established the Federal-Provincial-Territorial Connectivity Committee, which is working collaboratively to examine service levels, priorities, principles, and gaps, as well as to develop coordinated plans of action. In June 2018, the Department launched a national digital and data strategy consultation—of which connectivity is a foundational component—in order to drive innovation, prepare Canadians for the future of work, and ensure trust and confidence in the digital world. The Department continues to promote private-sector competition and investment through marketplace frameworks, spectrum measures, and initiatives to encourage innovative technologies. Collectively, these actions will help inform the development of a connectivity strategy within an overall framework for data and digital transformation. 1.38We found that Innovation, Science and Economic Development Canada (the Department) did not implement its Connect to Innovate program for broadband improvement in a way that ensured the maximum broadband expansion for the public money spent. The program did not include a way of mitigating the risk of government funds displacing private-sector investment. 1.39We found that the Department did not provide key information to potential applicants for funding under the program. As a result, some applicants had to invest more effort to prepare a proposal, and all applicants lacked full knowledge of the basis for selecting funding proposals. 1.41This finding matters because a key principle of the Connect to Innovate program was to avoid displacing private-sector investment and to intervene only in instances where a business case did not exist. Connecting Canadians was launched in 2014. It was a five-year, $240-million program. It allocated funding for projects to install the “last-mile” connection for 280,000 households that did not have access to Internet speeds of 5 megabits per second (Mbps) for downloading data and 1 Mbps for uploading data (5/1 Mbps). Connect to Innovate was launched in 2016. It was a five-year, $500-million program. It focused on bringing high-speed Internet to 300 rural and remote communities in Canada. The program provided support for backbone infrastructure to institutions such as schools and hospitals. It also allocated funding for backbone upgrades and for last-mile connections to households and businesses that did not have access to Internet speeds of 5/1 Mbps. 1.43Our recommendations in this area of examination appear at paragraphs 1.48, 1.54, and 1.60. 1.44What we examined. We examined whether the Department and the Canadian Radio-television and Telecommunications Commission (the Commission) relied on complete and accurate data to inform policy-making aimed at addressing the connectivity gap in rural and remote areas. In addition, we examined whether the Department designed and managed the Connect to Innovate program to maximize the value for money for taxpayers. 1.45Connectivity data. We found that the Department had accurate and detailed information on the current state of connectivity in Canada. In 2016, the Department collected detailed information on both wired services (through the Commission) and wireless Internet services in the country. This information included geographic coverage, Internet service speed, and the type of technology used. The Department used the information to identify underserved communities and determine which areas were eligible for funding under its Connect to Innovate program. The Department made the detailed connectivity data available to all provincial and territorial governments while respecting the confidentiality of service providers’ data. 1.46The Department published a map showing areas eligible for Connect to Innovate funding. The public map showed which companies offered which type of Internet services in each area. Eligibility for funding for last-mile projects was shown in hexagons, each of which covered 25 square kilometres. If no households in a hexagon had access to speeds of 5/1 Mbps or greater, the hexagon was identified as eligible for funding. However, if some households in a hexagon lacked access, that area was not identified as eligible. In these cases, an applicant interested in this area would have had to demonstrate their eligibility for the program. 1.47The Department stated that it designed the map to avoid infringing on expansion plans of existing Internet service providers. In our view, a map showing complete and detailed connectivity information in rural and remote areas would have been more useful. All funding applicants would have known directly whether their projects were eligible. With the information provided, some funding applicants had to demonstrate the eligibility of their projects. The lack of access to detailed data may have increased the workload for some potential applicants. In addition, detailed information would help to guide future public- and private-sector deployment of broadband Internet. 1.48Recommendation. Innovation, Science and Economic Development Canada, in collaboration with the Canadian Radio-television and Telecommunications Commission, should make a detailed connectivity map publicly available and update it regularly while respecting the confidentiality of service providers’ data. The Department’s response. Agreed. The maps of Innovation, Science and Economic Development Canada and the Canadian Radio-television and Telecommunications Commission are as detailed as can be published at this time while respecting the commercially sensitive nature of Internet service providers’ network information. The Department and the Commission continue to work with Internet service providers to refine the published maps. Over the last three years, the Department has made great efforts to advance connectivity mapping and data sharing. The improved National Broadband Internet Service Availability Map is one such example. The release of demographic data on the Government of Canada’s Open Data Portal is a second. More releases are planned later in the 2018–19 fiscal year, including community-level backbone connectivity status. The Department will continue to collaborate with the Commission on the ongoing collection and maintenance of up-to-date connectivity information. In consultation with industry, the Department will continue to evaluate what further refinements are possible while respecting the commercially sensitive nature of information being used in the maps. The Commission’s response. Agreed. The Canadian Radio-television and Telecommunications Commission will continue to collaborate fully with Innovation, Science and Economic Development Canada, to the extent permitted by the confidentiality provisions of the Telecommunications Act, in order for the publication of data on broadband service availability in Canada to be done using the highest possible detail level. 1.49Program design. We found that the Department conducted extensive consultations on the design of the Connect to Innovate program for broadband expansion and coordinated with provincial and territorial governments. For example, in Quebec, there was one application form for both the federal funding program and a comparable provincial program. The Department aimed to double its investments by requesting provincial funding to support Connect to Innovate projects. However, this approach did not maximize taxpayers’ money, as both provincial and federal funding came from taxpayers. 1.50The Department decided that Connect to Innovate would primarily fund backbone projects, and that only a small portion of the funding would be for last-mile projects. Stakeholders indicated that funding backbone projects was a good decision because backbone connections are crucial for feeding last-mile networks that bring connectivity to users. 1.51The Department intended to allocate funding for projects in underserved communities in areas that would otherwise not benefit from independent, private-sector investment. Instead, the Department determined that communities were eligible for Connect to Innovate funding if they were more than two kilometres away from existing fibre backbone infrastructure. 1.52Maximizing public funding. The Department used a comparative model that did not ask program applicants to demonstrate that their projects would not be feasible without public funding. The ability to predict which projects were likely to proceed without public funding, or with less public funding, is important: It would enable the Department to get the most broadband improvement out of the public funds and maximize the value for tax dollars spent. 1.53One way to minimize public investment for each project would be to use a “least-cost subsidy approach,” also known as a reverse auction. This approach can be used to allocate public funding to broadband deployment projects in a transparent, fair, and competitive manner. Under the approach, the government would propose a project and ask Internet service providers how much public funding they would need to carry out the project. The provider asking for the lowest government subsidy would be awarded the project. We found that the Department did not use this approach. In our view, it remains a practice worth considering. minimizes negative commercial effects on existing Internet service providers. The Department’s response. Agreed. The Connect to Innovate program was designed to maximize the outcomes and minimize the negative commercial effects on existing Internet service providers. Connect to Innovate brings backbone connections to underserved communities in areas that are often difficult to reach and that preclude private investment. Communities that would otherwise not benefit without targeted government support include the most expensive to connect, such as Arctic and Indigenous communities. A number of factors were considered to offer the greatest value and maximize outcomes. Cost was a significant factor when competing proposals targeted the same geographic area. The program did not support applications that overlapped the same area or those that would build in areas already served. Community benefits were also important. Innovation, Science and Economic Development Canada increased the total investment by leveraging other funding, allowing more projects to be funded. As a result, the program will connect almost 900 communities, three times its target, including an unprecedented number of projects that will benefit the North and Indigenous peoples. The Department will continue to collaborate with the Federal-Provincial-Territorial Connectivity Committee to articulate targets and expected outcomes for a national connectivity strategy and future programs, incorporating lessons learned from past broadband programs and findings of industry, Indigenous, and other stakeholder consultations. 1.55Lack of transparency in the selection process. Connect to Innovate had $500 million available for allocation to successful applicants. The program received 892 applications, with funding requests totalling $4.4 billion. In some cases, multiple projects covered overlapping areas. 1.56We found that the Department used a three-step process to evaluate applications. First, it screened the applications and assessed their merit. Second, officials from the Department and the Minister’s office assessed funding options, each including a different mix of eligible projects. For the assessments, officials told us that they considered what would result in the best value overall, whether a project overlapped with another application, and whether it duplicated a level of service already provided by an incumbent provider. Finally, the Minister provided conditional approval on selected projects. 1.57We found that there were a number of considerations to select projects, but the application guide did not specify the relative weight of each criterion used in the project selection process. Projects were less likely to be funded if they did not align with provincial and territorial priorities. However, these priorities were not made public. In our view, the Department should have made the weights and priorities public. 1.58Open access and coordination with the private sector. A requirement of Connect to Innovate was open access to program-funded backbone infrastructure. In other words, the infrastructure built with program funding had to be available for rental by other service providers at a set price. Open access is important to support the use and upkeep of the publicly funded infrastructure, as well as to foster local competition. 1.59To make business decisions, local Internet service providers need information such as the planned availability date, location, capacity, and price of the backbone to which they will have access. However, this information cannot be released until after the contracts have been signed. We found that the Department encountered delays in completing the due diligence work required ahead of signing. It began due diligence work on each project only after the Minister provided conditional approval. As of 30 June 2018, nine months after the Department announced the first project to receive funding, only three contracts had been signed. 1.60Recommendation. In a timely manner, Innovation, Science and Economic Development Canada should inform stakeholders of the planned availability date, location, capacity, and price of the backbone to which they will have access. The Department’s response. Agreed. A key feature of the Connect to Innovate program is third-party access to publicly funded backbone infrastructure. To be eligible, applicants had to commit to provide open access to infrastructure funded in whole or in part by the program. Projects must be open to third parties for dedicated capacity purchases on a wholesale or retail basis. Open-access provisions are included in Innovation, Science and Economic Development Canada’s contribution agreements to ensure that the benefits of public investments in broadband infrastructure can be realized by third parties, which may introduce competition and diversity in the marketplace for consumers. The Department has advised successful project proponents that information on access pricing will be made publicly available in a timely manner as contribution agreements are signed. Initial steps have already been taken as demonstrated by the improved National Broadband Internet Service Availability Map on the Department’s website and by the data that has been shared on the Government of Canada’s Open Data Portal. These vehicles provide further project information, such as new backbone services available through open access to projects funded by the program. 1.61We found that small Internet service providers struggled to acquire high-quality spectrum to improve broadband deployment in rural and remote areas. For example, Innovation, Science and Economic Development Canada (the Department) auctioned spectrum licences for geographic areas that were too large for smaller service providers to submit bids for. The secondary market for unused spectrum did not function well, partly because licensees had little business incentive to make unused spectrum available for subordinate licensing. In addition, the information on unused spectrum was not readily available to interested Internet service providers. 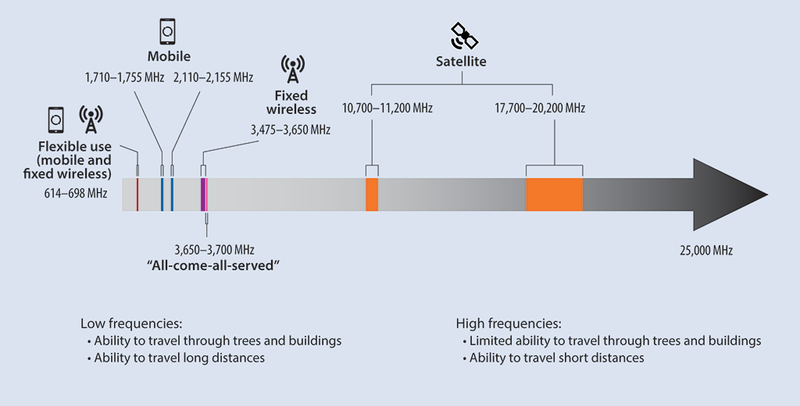 1.63This finding matters because many Canadians in rural and remote areas rely on fixed wireless broadband solutions for access to services that otherwise might not be available outside urban areas, such as health care, education, and banking services. 1.64Wireless Internet service providers need access to radio frequency spectrum bands, which are publicly owned and are regulated by the Government of Canada. Devices such as radios, smart phones, tablets, smart appliances, and computers all use spectrum to send and receive data. 1.65Spectrum can be used for various purposes. In some cases, the use is dictated by a licence. A band can be licensed for a specific purpose, such as mobile (smart phone), fixed wireless (broadband Internet), or satellite; or else it can be licensed for flexible use. Service providers that hold a flexible use licence can decide how they use that spectrum. For example, a flexible use licence can be used for both mobile and fixed wireless services (Exhibit 1.2). Note: During our audit, consultations were under way on whether to convert the 3,475 to 3,650 megahertz (MHz) spectrum band to flexible use. 1.66Spectrum is finite and the demand to use it is high. Therefore, the government used auctions to allocate the right to use certain spectrum bands in certain geographic areas. The winners received licences that gave them the right to transmit signals over those spectrum bands in a specific geographic area for a fixed period of time. Licence holders can make their unused spectrum available to a third party through a subordinate licence (also called a sub-licence). 1.67Over the last 20 years, the Department developed and implemented spectrum management policies aimed at deploying fixed wireless and mobile broadband services to rural and remote areas. For example, for fixed services, the Department offered some bands of licence-exempt spectrum, and it also adopted an “all-come-all-served” approach, where spectrum is licensed on a shared basis, for the 3,650 to 3,700 megahertz (MHz) spectrum band. 1.68Our recommendations in this area of examination appear at paragraphs 1.77 and 1.81. 1.69What we examined. We examined whether Innovation, Science and Economic Development Canada managed spectrum to support the availability of broadband services in rural and remote areas, where appropriate. 1.70Unmet demand for spectrum for fixed wireless broadband. Wireless Internet service providers expressed concern that the government did not make adequate and sufficient spectrum available to provide reliable broadband services in rural and remote areas. We found that the Department did not analyze the spectrum needed by service providers to improve broadband deployment in these areas. 1.71In June 2018, the Department launched consultations on converting the 3,500 MHz spectrum band (specifically, 3,475 to 3,650 MHz) to flexible use from the fixed broadband service for which it had been used. We found that conversion would increase the spectrum available for mobile access, but some Internet service providers expressed reservations. According to them, conversion could reduce the spectrum available for fixed wireless broadband solutions in rural and remote areas. 1.72Unused auctioned licensed spectrum in rural and remote areas. The Department’s auctions for spectrum licences typically covered large geographic areas that included urban centres and the surrounding rural regions. The spectrum licences required licensees to deploy services to a stated percentage of the population in the licence area over time. However, licensees could easily meet the population coverage requirements by providing services primarily in the main urban centres in the licensed area. 1.73We found that the deployment conditions did not provide a strong enough incentive for licensees to offer services outside the major urban centres covered by their licences. This resulted in unused licensed spectrum in rural and remote areas of Canada. 1.74In March 2018, the Department announced the licensing framework for its 2019 auction in the 600 MHz band (specifically, 614 to 698 MHz). The auction will include flexible use licences to allow for the deployment of both mobile and fixed wireless Internet services. This band is well suited for rural and remote areas but has also shown potential for 5G, the next (fifth) generation of mobile wireless technology, expected to be deployed in coming years. The new technology is anticipated to increase data transmission speeds, improve capacity, and reduce lag times. These advances will lead to new economic opportunities and will support applications such as driverless vehicles and a vast expansion in sensors used for the Internet of things (the network of connected physical devices such as vehicles and buildings). Wireless operators plan to invest heavily in coming years to deploy 5G service. One concern, however, is that competition for access to radio frequencies will have an effect on rural connectivity and could eventually hurt Internet users in rural and remote areas. 1.75The Department adopted more stringent deployment conditions for the 600 MHz auction in 2019. The aim was to facilitate timely availability of services across the country, including in rural and remote areas. Despite these enhancements, Internet service providers will not be required to meet deployment conditions in the smallest population areas until the end of the 20-year licence period. As a result, the new deployment conditions may leave many rural and remote households underserved at the end of the licence period. 1.76The Department chose to set aside 40% of the spectrum in the 600 MHz auction for regional telecommunications providers. This measure aims to improve competition in auctions that generally favour big telecommunications providers. However, small wireless Internet service providers generally do not have the financial resources to participate in auctions for licences that cover large geographic areas. In our view, the set-aside alone may not be sufficient to bring high-quality broadband coverage to smaller rural and remote areas. subordinate licensing incentives for unused spectrum in underserved areas. The Department’s response. Agreed. Innovation, Science and Economic Development Canada has recognized the importance of wireless services for Canadians in all regions. The Department is committed to encouraging affordable telecommunications services to help bridge the digital divide, foster inclusivity, and support an innovative economy. The Department will continue to develop policies that encourage service into rural areas to ensure that all Canadians benefit from high-quality services, ubiquitous coverage, and affordable prices. These policies will continue to be developed in a transparent manner through consultation. The Department will continue to address the needs of rural and remote communities when developing licensing rules, including consideration of the geographic size of licences and measures to increase deployment outside urban areas. The Department will study unused spectrum in underserved areas and consider approaches to make that spectrum available when there is a demand. The Department will continue to make spectrum available through a variety of licensing methods, such as auctions and non-competitive licensing processes, and will make spectrum available for licence- exempt use. The Department will continue to foster mobile wireless Internet services in rural and remote areas. The Department’s spectrum policies have enabled mobile broadband coverage to 98.5% of the population. 1.78Challenges with accessing unused spectrum. We found that Canada did not have a well-functioning market in which smaller service providers could sub-license unused spectrum from licence holders as third-party licensees. The existing sub-licensing framework could make subordinate licensing complicated for primary and third-party licensees. For example, the Radiocommunication Act requires that a third party hold a licence. This requirement means that ministerial approval is required for every trade. The Department aimed at completing the approval process for subordinate licensing within 12 weeks in normal circumstances. We noted that the United Kingdom aimed to complete similar requests within half the time. 1.79We found cases in which wireless Internet service providers in need of spectrum to provide their services had difficulty sub-licensing unused spectrum from licensees. This difficulty was partly because the information on unused spectrum was not readily available to interested Internet service providers. For example, the Department did not maintain a user-friendly database on unused spectrum. In some cases, however, it was not in the interests of the primary licence holder to sub-license some of its spectrum, even though the primary licence holder’s deployment conditions could be met through subordinate licences. 1.80Many countries face long-standing challenges related to the establishment of a secondary market that allows for the trading, sub-licensing, and division of spectrum licences. Canada is no exception. As of June 2018, the three main telecommunications companies held 1,351 spectrum licences that could be sub-licensed. However, the three companies had issued only 108 subordinate licences to regional and small telecommunications providers. providing public information that would help service providers in rural and remote areas seeking to access spectrum via sub-licensing. The Department’s response. Agreed. Innovation, Science and Economic Development Canada develops spectrum policies that promote the availability of reliable and affordable services across Canada, and support efficient functioning markets. As such, when developing these policies, the Department recognizes that, in some cases, rural and remote communities can only be served by having access to spectrum. While the Department does not mandate secondary market access to unused spectrum, it does encourage access through its rules regarding the transfer and division of spectrum licences. The Department has never denied an application for a subordinate licence to a small wireless Internet service provider. The Department has regional offices that are available to assist those seeking access to spectrum. The Department has been reaching out to a variety of wireless Internet service providers to better understand their spectrum use, as well as any challenges they have experienced accessing additional spectrum, including any impediments with respect to the secondary market. The Department will use this information to review any licensing rules or information gaps that are impeding access to spectrum by rural operators. 1.82We concluded that Innovation, Science and Economic Development Canada and the Canadian Radio-television and Telecommunications Commission, according to their respective roles and responsibilities, monitored the state of connectivity but did not share enough detailed information publicly. We also concluded that Innovation, Science and Economic Development Canada did not develop and implement a national strategy to improve broadband Internet connectivity to a specific service level in rural and remote areas. This independent assurance report was prepared by the Office of the Auditor General of Canada on rural and remote connectivity. Our responsibility was to provide objective information, advice, and assurance to assist Parliament in its scrutiny of the government’s management of resources and programs, and to conclude on whether the government’s activities in relation to rural and remote connectivity complied in all significant respects with the applicable criteria. All work in this audit was performed to a reasonable level of assurance in accordance with the Canadian Standard for Assurance Engagements (CSAE) 3001—Direct Engagements set out by the Chartered Professional Accountants of Canada (CPA Canada) in the CPA Canada Handbook—Assurance. The Office applies Canadian Standard on Quality Control 1 and, accordingly, maintains a comprehensive system of quality control, including documented policies and procedures regarding compliance with ethical requirements, professional standards, and applicable legal and regulatory requirements. In conducting the audit work, we have complied with the independence and other ethical requirements of the relevant rules of professional conduct applicable to the practice of public accounting in Canada, which are founded on fundamental principles of integrity, objectivity, professional competence and due care, confidentiality, and professional behaviour. confirmation that the audit report is factually accurate. The objective of this audit was to determine whether Innovation, Science and Economic Development Canada and the Canadian Radio-television and Telecommunications Commission, according to their respective roles and responsibilities, monitored the state of connectivity as well as developed and implemented a strategy to meet the connectivity needs of Canadians in rural and remote areas. We audited Innovation, Science and Economic Development Canada (the Department) and the Canadian Radio-television and Telecommunications Commission (the Commission). We examined how the Department and the Commission monitored the current state of connectivity in rural and remote areas, and how the Department assessed and used this information to inform the deployment of broadband Internet and to foster connectivity for all Canadians. We also examined whether the Department developed an appropriate strategy so that Canadians in rural and remote areas could access affordable, sustainable, and high-quality broadband Internet services. This included elements such as the Connecting Canadians and Connect to Innovate programs, and access to sufficient spectrum to meet the connectivity needs of rural and remote Canada. The scope of the audit did not include issues related to the availability of mobile broadband services, affordability, digital literacy, and the Commission’s $750-million fund to improve broadband access in rural and remote communities. The scope also did not include the programs with a connectivity component that were managed by Infrastructure Canada, the Canada Infrastructure Bank, Indigenous and Northern Affairs Canada, Canadian Heritage, regional development agencies, or Health Canada. During the audit, we interviewed officials from the Department and the Commission, as well as from other federal organizations. We also interviewed officials from other levels of government, officials from foreign governments, and stakeholders to understand the funding programs for the deployment of broadband Internet. Finally, we reviewed and analyzed documents provided by officials and other stakeholders. Innovation, Science and Economic Development Canada and the Canadian Radio-television and Telecommunications Commission rely on complete and accurate data in order to inform policy-making and regulation aimed at addressing the connectivity gap in rural and remote areas. Innovation, Science and Economic Development Canada develops and implements an appropriate strategy to respond to the connectivity needs of rural and remote Canada, monitors progress, and measures outcomes. Innovation, Science and Economic Development Canada designs and manages the Connecting Canadians and Connect to Innovate programs to maximize the value for money for taxpayers. Innovation, Science and Economic Development Canada manages the spectrum to support, where appropriate, the availability of broadband services in rural and remote areas. The audit covered the period between 1 January 2013 and 30 June 2018. This is the period to which the audit conclusion applies. We obtained sufficient and appropriate audit evidence on which to base our conclusion on 7 September 2018, in Ottawa, Canada. The following table lists the recommendations and responses found in this report. The paragraph number preceding the recommendation indicates the location of the recommendation in the report, and the numbers in parentheses indicate the location of the related discussion. 1.48 Innovation, Science and Economic Development Canada, in collaboration with the Canadian Radio-television and Telecommunications Commission, should make a detailed connectivity map publicly available and update it regularly while respecting the confidentiality of service providers’ data. (1.45 to 1.47) The Department’s response. Agreed. The maps of Innovation, Science and Economic Development Canada and the Canadian Radio-television and Telecommunications Commission are as detailed as can be published at this time while respecting the commercially sensitive nature of Internet service providers’ network information. The Department and the Commission continue to work with Internet service providers to refine the published maps. Over the last three years, the Department has made great efforts to advance connectivity mapping and data sharing. The improved National Broadband Internet Service Availability Map is one such example. The release of demographic data on the Government of Canada’s Open Data Portal is a second. More releases are planned later in the 2018–19fiscal year, including community-level backbone connectivity status. 1.60 In a timely manner, Innovation, Science and Economic Development Canada should inform stakeholders of the planned availability date, location, capacity, and price of the backbone to which they will have access. (1.58 to 1.59) The Department’s response. Agreed. A key feature of the Connect to Innovate program is third-party access to publicly funded backbone infrastructure. The Department will continue to make spectrum available through a variety of licensing methods, such as auctions and non-competitive licensing processes, and will make spectrum available for licence-exempt use. Spectrum—The full range of radio waves that are used for wireless communication. This entry was posted in CRTC, First Mile, Infrastructure, National, News. Bookmark the permalink.